OXFORD, Miss. 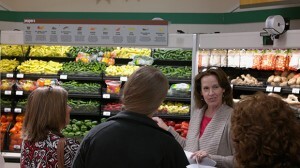 – Janie Cole, registered dietitian and adjunct professor in the Department of Nutrition and Hospitality Management at the University of Mississippi, leads a group of six through an Oxford grocery store. She hands out a “Grocery Store Shopping“ guide that provides tips such as “Plan ahead and make a list” and “Don’t be on your phone while shopping. It gets you off task.” Cole tells the group to examine and compare nutrition facts for deli meats, bread, cereal and bacon. The grocery store tour is a part of the weight management program organized by UM’s Nutrition Clinic, which is devoted to helping the community with weight loss, eating disorders and other nutrition issues. The program offers weekly group meetings, food record analysis, cooking demonstrations, tastings and one-on-one consults. The weight management classes begin Jan. 21 at Lenoir Hall and are open to the public. The fee for the 12-week course is $150. Participants can register for the classes by calling the UM Nutrition Clinic at 662-915-8662 or by emailing umnutritionclinic@olemiss.edu.